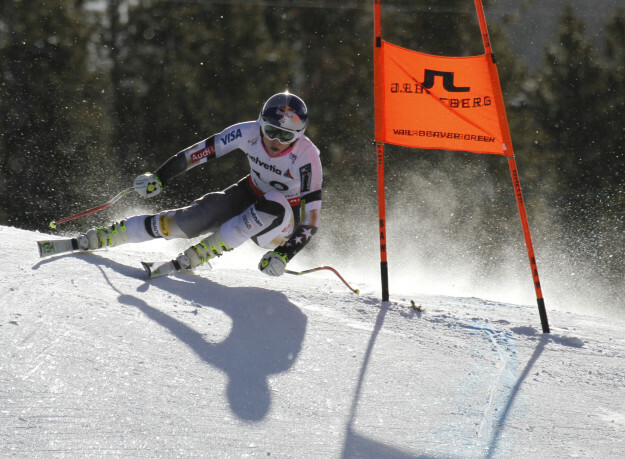 Lindsey Vonn has a couple more slim chances at a medal in the 2015 Alpine World Ski Championships — in today’s alpine combined and Thursday’s giant slalom (Matt Inden photo). Vail’s Lindsey Vonn has yet to compete in a technical ski race (slalom or giant slalom) this season, but her chances of grabbing an elusive gold in front of her hometown fans now boils down to how she does in those events today and Thursday at the World Championships. Vonn was obviously very disappointed to finish fifth at Beaver Creek Friday in her signature event, the women’s downhill on Raptor. But she was already looking forward to today’s combined (one run of downhill, one run of slalom) and Thursday’s GS. “I want to thank all of the spectators for coming out; it was an amazing atmosphere,” Vonn said of Friday’s race, which was won by Slovenia’s Tina Maze. “The organizers did an amazing job. I’m really proud to be racing at home. I wish I could have done something better for the public and my family. The downhill portion of today’s alpine combined starts at 10 a.m. on Beaver Creek’s Raptor course, followed by the slalom at 2:15 p.m. Strange things can happen in the event, including a surprise bronze medal for Ted Ligety on Sunday after trailing in the downhill by more than three seconds. Of her record 64 career World Cup wins, five of them have been in combined events, but she’s never been on a podium in the event at the World Championships or Winter Olympics, so she’s right to be realistic about her chance today and Thursday. She hasn’t even competed in a combined event on the regular World Cup circuit in two years. Slovenia’s Tina Maze, gold medalist in Friday’s downhill and silver medalist in Tuesday’s super-G, is a heavy favorite today to improve on her silver in the event from the 2013 World Championships. Vonn has been training slalom hard the last few days, but she hasn’t been on a slalom podium in six years. Squaw Valley’s Julia Mancuso, always a threat in big events (she’s a four-time Olympic medalist and five-time World Championships medalist), has an Olympic silver and bronze in combined and a World Championships silver in the event as well. She can never be counted out in combined. In GS, Vonn has won three World Cup events in her career, but none since blowing out her knee at the last World Championships in Schladming, Austria, in February of 2013. Vonn last won a GS just two years ago in Maribor, Slovenia, in January of 2013 – right before those fateful Worlds, where her crash in super-G cost her a shot at the Sochi Winter Olympics. The season before that she was second in a GS in Offerschwang, Germany, and then won a GS in Are, Sweden, in March of 2012. The first run of Thursday’s women’s GS starts at 10:15 a.m., and the second run is set for 2:15 p.m. Eagle-Vail’s Mikaela Shiffrin, winner of the season-opening GS this season in Soelden, Austria, and a fifth-place finisher in GS at last year’s Sochi Winter Olympics, will be among the contenders. All the races are free and open to the public. Go to the official website for more information.